The U by Kotex overnight ultrathins are exactly that – ultra thin and still give excellent protection overnight even on heavy days. I have bought these many times and am always happy with them. The claims for overnight really do live up to its claim. They are longer than usual pads and really hold up well overnight. Never an issue with leakage. I love these pads by U By Kotex. The pads are a good size and perfect for overnight. They are not bulky and fit well. I love the colours which make them easy to find in the handbag and in the underwear drawer. I love these pads not only because of great colourful packaging but they are comfortable, theres no leaking, easy to carry them around and i use them all time. Well sent these a treat my 13 year old loves them! Great colours and absorption, comfortable and no rubbing like the old pads we use to use, discreet and a great price! These are a regular item in our trolley. Since having my daughter nearly 3 years ago, I’ve had heavier periods, and these give me piece of mind that I am not going to leak overnight and make an mess. They’re easy to use, and don’t glue themselves to your undies like I’ve found some other products do, but at the same time they stick and don’t move around either. 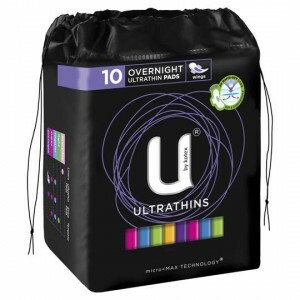 How would you rate U By Kotex Ultrathins Overnight?